Have you ever built a structure out of Legos? Used a hot glue gun? Attempted a Pinterest project? Built a piece of furniture, created your own jewelry or sewn your own clothes? Have you ever thought of a creative solution to a problem? Then you’re a maker, and therefore part of the Maker Movement — a community of DIY-ers, tinkerers, craftsmen, manufacturers, artists, dreamers and students, all who believe in the power of doing. The Maker Movement is the embodiment of the do-it-yourself, tech community — a celebration of the ever-growing culture bred from the cross section of collaboration and creativity that is continuously recruiting people and ideas and technologies and inviting them to be tested and broken and shared. Makers are everywhere — welding in a garage, tucked away in a lab or DIY-ing on the living room floor — but the community’s unofficial headquarters are all around the nation, and creating a place for makers of all kinds in the form of Makerspaces. At their core, Makerspaces are creative work spaces where people can make things. They’re equipped with digital fabrication tools like 3D printers, laser cutters, computer numerical control (CNC) machines and soldering irons. They offer workshops and programs to teach people how to create physical products and turn their ideas into realities. One of the most valuable assets to Makerspaces is their establishment of a collaborative, creative space for people of all ages, from all disciplines. At the onset, the spaces can be a bit daunting — many people have never designed their own video games or built robots, but that’s exactly for what these spaces are intended. You learn how to use one program, then another, and you quickly realize you can literally make almost anything — fidget spinners, personalized cutting boards, a new case for your iPhone, the missing mouthpiece to your daughter’s clarinet (we’ve recently 3D printed this one), the prototype you need to get your provisional patent (we’ve recently made this one, too). Once you start making, you realize that nothing is impossible, and you have the equipment at your fingertips to solve almost any problem you face. It’s an incredible, liberating feeling, and a great lesson for students of all ages. Think of the feeling you get when you finish a Pinterest project or place the last Lego on your Lego city. In a Makerspace, it’s like finishing a project, then realizing you’re standing in a room full of equipment that can help a whole community create their own projects — a room full of tools that can empower and excite an entire city. By giving a community tools to solve the problems it faces, we’re creating a culture of confident, creative inventors, and asking them to collaborate with one another to make a difference. Suddenly, making is not only relevant in manufacturing, innovation and entrepreneurship, but it has real value in the civic and economic development realms and is an extremely beneficial educational tool. Everyone has the ability to learn new skills, think entrepreneurially, create products and jobs and rethink the way we approach education. “The Maker movement is reshaping U.S. cities, creating an entirely new wave of economic opportunity, one that has the potential to involve people from all walks of life and life stages and do it in a way that is uniquely American,” say the Maker City authors. Fortunately for Arkansans, maker cities are emerging around the state and creating epicenters for making and problem solving. 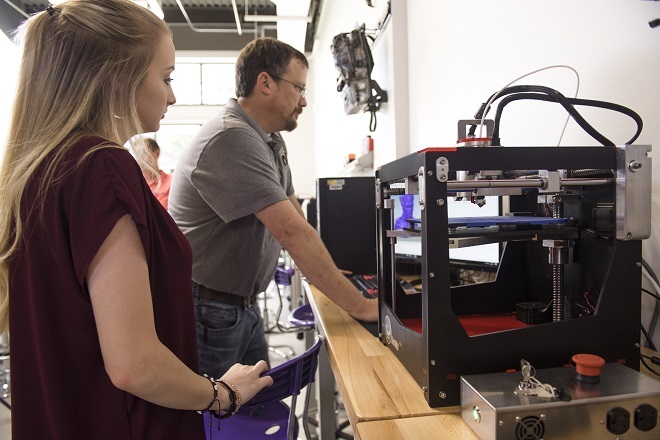 Campus-based Makerspaces are creating multi-generational collaborations among makers of all ages and catalyzing a more engaged creative community. Imagine the ideas generated from a space filled with collegiate students, 3D printers, expert makers and K-12 students working on science or art projects alongside an entrepreneurial networking event. In Makerspaces, everything is possible and everyone is a maker. We all have new ideas. Now we have the tools to make our ideas realities. To get involved in the maker movement, visit a Makerspace to discover what you can create and what problems you can solve. In a Makerspace, everything is possible.